Vickie Angel is not happy when Gus informs her they're invited to a very social dinner party at the Randells. Written by George Tibbles, Bill Kelsey, Fran Van Hartesveldt. When Vickie goes with a friend to visit the office of an obstetrician, Gus mistakenly thinks the Angels are due for a visit from the stork. � 1957 / Don Fedderson Prod. no. 456-7. Jimmy Boyd ........... Wheeler "The Wheel"
The city plans to remove a stunted oak tree from the front of the Angels' home. Vicki decides to start a petition to save it. Vickie and Gus get involved in city politics when a stunted tree in their parkway is to be removed. The Main Characters: Do you remember the Hatfields and the McCoys? director of photography, Nick Musuraca, A.S.C. The Plot: Wait till the Atomic Energy Commission hear about this! The Characters: They have their own Fallout! Vickie and Gus are unable to get out of helping friend Finley plan a show for the local boys Club. Don Fedderson Prod. no. 456-6. Vickie makes up a story about an appointment Gus has in Santa Barbara. The Plot: Something Old, something New, something Borrowed, something Blue - UP! Vickie Angel goes to buy Gus a gift in a department store. While there she�s asked to take a job as a salesgirl for one day and accepts. 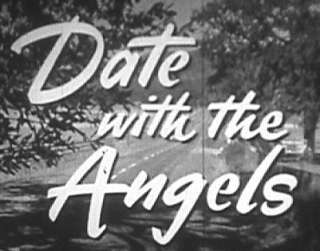 Vickie Angel and her friend Wilma Clemson decide to marry off Gus�s secretary to bachelor Dr. Gordon. The Time: Vickie Angel's first birthday, since she married Gus Angel, that is! The Characters: High and Flighty! Bill plans a surprise birthday party for Vicki, but she is led to believe that he is going to run away with her neighbor. Both Gus and Vickie are in for a surprise. Gus had planned to surprise Vickie with a trip to San Francisco for her birthday. Note: the program was pre-empted in most time zones for Football-College All-Stars vs. NFL Giants. director of photography, Sid Hickox, A.S.C. The Main Character: There's no business like monkey business! A stuffed gorilla greets the Angels in their living room when they return from their vacation. director of photography, Maury Gertzman, A.S.C. A girl friend of Vickie Angel is about to have a baby and her husband is out of town. Note: �Nobody�s Father� episode scheduled for this week, postponed until 08Nov57. [--] 18Oct57 Pre-empted for the one hour premiere of "The Frank Sinatra Show"
Vickie boasts to her neighbors that singer Dennis Day has dropped in to ask her opinion of a new song. Vickie spots Liberace dining at the Brown Derby while the Angels are there, but Bill doesn't believe her. Then Dennis Day shows up at their house to make matters worse. Assuming Vickie will be glad to meet one of his old acquaintances, Gus brings home Diane, an ex-girlfriend. The Plot: Aloha! - in Hawaiian that means Good day, Goodbye, Good grief! Vickie claims to have witnessed a bus accident involving her erratic neighbor, Mr. Finley. The Characters: They threw the book at us. The Angels� neighbors the Murphys have a son in the Navy. Murphy has always spoken of his son as a he-man sailor. The Main Character: ... well with one possible exception! The elderly Santa hired by the department store thinks he can give away all the toys! By this escapade, the "Scrooge"
department store manager (Richard Deacon) discovers the real meaning of Christmas. Look for the American Flyer train layout. Erector sets, and other Gilbert toys in the store! his promise to the kidsby giving them what they want from the store's inventory! In an attempt to lose an insurance deal, Gus finds it necessary to spend time at a race track. Vickie and Gus find themselves nearly ousted from their new mountain cabin when teenaged Wheeler pays them a return visit. The Place: But it happened on a Train! director of photography: Henry Cronjager, A.S.C. "too helpful" toward the tall brunettes and pretty girls in the Pullman car! The Main Character: Call me honey! The Plot: Everybody else does! like Vicki has a fight with her gangster-type boyfriend. *Note: Betty White plays both Vickie and Honey.